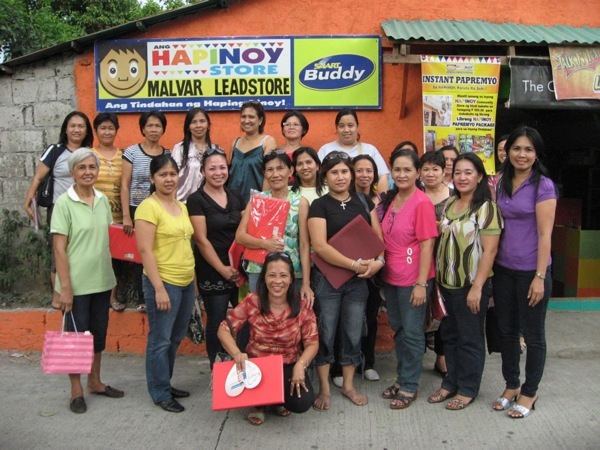 The Hapinoy Store Program trains Southern Luzon’s women micro-entrepreneurs in personal and business development, management systems, and better priced goods, and introduces additional revenue channels. GROWING up in a political family like the Aquinos of Tarlac, it was inevitable for Paolo Benigno “Bam” Aquino IV to become involved in social development issues, he said. Aside from having the late Sen. Benigno “Ninoy” Aquino Jr., and President Corazon Aquino as his uncle and aunt, Bam’s cousin, Noynoy, is now president as well. And his father, Paul (the youngest of the late senator’s brothers), has been a key player in most political campaigns involving the Aquinos. His mother, Melanie, on the other hand, is a keen volunteer in religious social services groups. Gasgas na to say this, I know, but Bam does bear a striking resemblance to his late uncle, it’s almost unnerving. Of course I’ve seen him on TV before hosting a morning show, but now just seated six feet across me, I marvel at the uncanniness of it all. This was no political meeting I was attending, however. In a lunch tendered by MasterCard Philippines, a select group of journalists including myself met with Bam to talk about his Hapinoy Store Program. It is the micro-entrepreneur program of Microventures Inc., an organization he set up with friends Michelle Pabalan and Mark Ruiz, targeting the poor and disaffected members of our society, specifically the women and mothers in the rural communities. The program won for Microventures a $25,000 Women’s Empowerment Grant from the Singapore National Committee for UN Women and MasterCard—the grand prize in the “Project Inspire: 5 Minutes to Change the World” grand finals which was held at the INSEAD Asia Campus in Singapore. There were 10 finalists all over the world, selected out of 450 teams who submitted their “life-changing ideas” to empower women and girls across Asia Pacific, the Middle East and Africa, in the form of a five-minute pitch videos or written proposals. 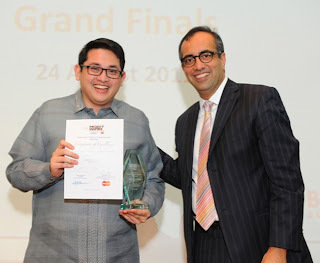 Two finalists, including Microventures, were from the Philippines. “Part of the reason we set up Microventures was that we realized that were was a gap in the microfinance sector in terms of business development. There are a lot of NGOs [nongovernmental organization] and social development organizing but when it comes to business development for the really small entrepreneur, there’s a gaping hole. That’s one gap we see in terms of getting the poor out of poverty. Finally, there’s financing, there’s capital, but there is no assistance to get their businesses to a higher level,” Bam explains. The target beneficaries not only get loans but are trained in all aspects of running a business, making it a more sustainable framework for social development. He adds there are about 800,000 sari-sari stores nationwide accounting for 40 percent of the total retail sales in the country. Clearly, sari-sari stores provide a vital lifeline to many communities, especially those in remote areas, as these are the only establishments that provide basic commodities and daily needs of residents. Through the program, the storeowners are given access to capital through Microventures’ partner institutions such as the Center for Agriculture and Rural Development (CARD-MRI), the largest microfinance institution in the Philippines. “Usually it’s P3,000 to P5,000 for sari-sari store owners, and tens of thousands [of pesos] for community store owners,” says Bam. A community store acts like the main commissary in an area of Hapinoy sari-sari stores. Women micro-entrepreneurs, dubbed Hapinoy Nanays, are tapped for the program which aims to help them establish “a profitable and sustainable business, reap practical and tangible benefits from partners and microfinance institutions, become knowledgeable with the help of training programs and support services, and be confident and empowered. Why women and not men? Bam’s group of course follows the basic microfinance model set up by the Grameen Bank of Bangladesh, where women have been found to be the most dependable in terms of repaying loans. “They have a loan repayment rate of 99 percent!” he enthuses. Bam Aquino, president of Microventures Inc., receives the Project Inspire winner's certificate from Vicky Bindra, president of MasterCard Asia-Pacific, the Middle East and Africa. Although he does note that in the past four years of the program, a number of men—the husbands of their Hapinoy Nanays—have started attending the women’s meetings. Mostly they do this out of curiosity, as the men try to find out what’s keeping their wives so busy. Eventually, Bam says, the men become involved in the program indirectly, as most sari-sari stores or community stores are family enterprises anyway. The products and services sold by these stores range from basic commodities and common grocery items to “more specialized projects with community impact like solar lanterns, medicine and affordable technologies,” he stresses. What I find appealing about the program is that there is an effort to tap local suppliers which helps even more people other than the targeted beneficiaries. The program boosts the community producers and downstream micro-industries in project areas, as well. “For example, in Laguna, we can have peanuts and sweets from their area. But you won’t find the same type of sweets in Bicol. Like the rice in the Laguna stores will come from farms in the area, but the rice in Bicol will come from there,” explains Bam. Among the community producers, he says, are the agrarian reform farmers who are Hapinoy’s source for the rice and sugar the nanays sell in their stores. The Hapinoy Store Program currently covers 150 communities mostly in Southern Luzon and Bicol, and has targeted to expand to 400 communities by the end of the year. Bam says the $25,000-grant his group received via Project Inspire will help them expand their program. Project Inspire was launched in March 2011 to commemorate the 100th year of International Women’s Day and to celebrate MasterCard’s 25th year in the region. She explains that despite the great strides in their socioeconomic standing in the last 100 years, statistics show that women account for 70 percent of the world’s poor. It’s probably not easy being an Aquino, considering the pinnacles of success many of its members have reached. But having become an advocate for the oppressed and the poor mothers of this land, Bam, only 34, certainly more than measures up to the task of keeping the family name not only respectable, but honorable. I’m pretty sure he will reach far greater heights, as well. •For more information on Project Inspire, click on www.5MinutestoChangetheWorld. Those who wish to support Hapinoy and its projects, click www.hapinoy.com.